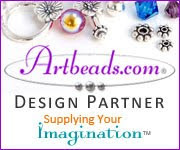 Disclosure: I received this offer within the frames of Artbeads.com blogging program. The author of this blog has not received any payment from above-mentioned company. The post above represents only personal opinion of the blog author.